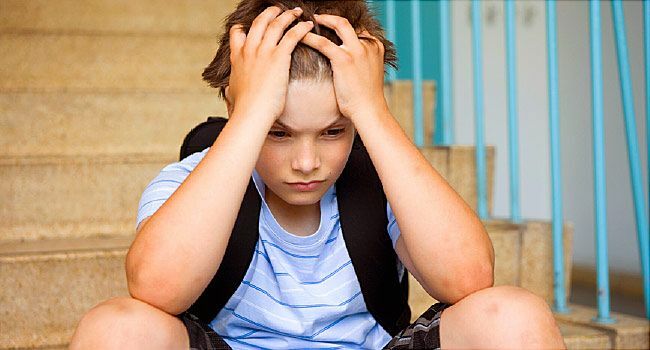 Aug. 17, 2015 -- Children are showing signs of stress as early as grade school, but their parents are not seeing it, suggests a national survey by WebMD. At the same time, a majority of parents say that personally, they’re very stressed. The WebMD Stress in Children Consumer Survey included 432 parents of children ages 5 to 13. The responses were collected from June 1 to July 31, 2015. Nearly 1 in 5 parents surveyed rated their own stress levels at a maximum “10 out of 10,” and more than half (57%) said their stress was at 7 or higher. But they considered their children to be under very little stress: 60% of parents rated their kids’ stress at 4 or below. 43% of parents said their children were arguing more. 37% reported increased crying or whining. 34% said their children appeared worried and anxious. 44% of parents reported that their children complained of headaches. 38% reported nightmares or trouble sleeping. 20% said their children had decreased appetites or other changes in their eating habits. And 1 in 5 parents (20%) said that their child had undergone behavioral counseling or therapy. Whether parents realize it or not, stress among kids is common. The stress kids now feel in early childhood continues to mount as kids get older. The American Psychiatric Association’s Stress in America survey finds that high school students report stress levels that top those of adults. More than half of all college students (54%) have felt “overwhelming anxiety” sometime within the last 12 months, according to the American College Health Association, up from 48.4% in 2010. Hassink says she believes stress is the top health problem facing kids today. While about half of parents ranked school/homework (53%) and friends (51%) as the primary sources of their children’s stress, a key source of anxiety for children appears to be their environment at home. Many families have been going through tough times, with 60% of parents reporting at least one majorly stressful event affecting their families in the past year. 27% had a job loss or financial problems. 19% went through a serious illness of a family member or friend. 21% experienced the death of a family member or friend. 9% had a separation or divorce. 31% had another emotionally difficult situation. Bullying is another source of stress for children, and 38% of parents reported that their children had experienced bullying or teasing in the last year. Kids who are bullied seem to be having a particularly hard time at home: 51% of their parents rate their stress levels an 8 or 10. Families of bullied kids were also more likely to have had a difficult family situation, such as a job loss or serious illness. The bullied children were also more likely to have negative behaviors such as arguing and lying, along with physical complaints such as stomachaches and headaches. Stan Davis, a longtime school counselor and author of several books on bullying, advises parents of children who are being excluded or otherwise bullied at school to focus on building positive support networks for their child through after-school clubs and social activities, for example. Standing up to bullies and telling them to stop doesn't work, he says. He has surveyed more than 13,000 young people on the topic for the Youth Voice Research Project. When asked how their kids cope with stress, a majority of parents said primary outlets were video games or TV and movies -- solitary pursuits Hassink says aren’t the healthiest way of relieving stress. Sixty-five percent said their children watched TV or movies, and 50% said they played video games. But kids also used free play (58%), playing with friends (55%), sports or exercise (44%), reading (41%), and art, music, or other creative activities (39%) as stress busters. Parents may not realize it, but some of their behaviors may be helping their kids learn how to handle stress. Most reported spending time together nearly every day with their kids. When asked about opportunities to spend time together, parents reported eating family meals together an average of 5.4 times per week, and spending about 4.3 hours of “down time” with their children per week. Down time means spending time with a child that is free of electronics and not task-oriented. The WebMD Stress in Children Consumer Survey was completed by 432 random WebMD site visitors from June 1 through July 31, 2015. All WebMD visitors had an equal probability of beginning the survey. Only respondents with children 5 through 13 years old living at least part-time in their home, and for whom the respondent was a parent or guardian, were allowed to complete the survey. The survey’s margin of error varied from question to question, but overall the survey is accurate to within plus or minus 4.8 percentage points. Editor's note: This story was updated to correct the percentage of parents who rated their children's stress levels at 4 or below, and to correct the margin of error of the survey. WebMD Stress in Children Consumer Survey, June 1 to July 31, 2015. Anxiety and Depression Association of America: "Children and Teens." American Psychiatric Association: "Stress in America: Are Teens Adopting Adults’ Stress Habits?" American College Health Association Survey, Spring 2014. American College Health Association Survey, Spring 2010. Carrie Bashoff Spindel, PhD, clinical assistant professor, department of child and adolescent psychiatry, NYU Langone Medical Center, New York. Stan Davis, school counselor and author, Youth Voice Research Project.